TORONTO, Ontario, Canada, November 22, 2013 (ENS) – Ontario is going coal-free. 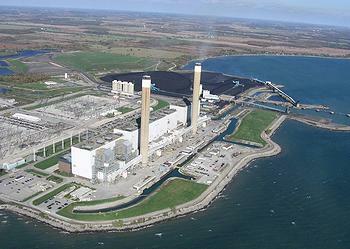 The largest coal-burning power plant in North America, Nanticoke Generating Station on the north shore of Lake Erie, will stop burning coal this year, Ontario Premier Kathleen Wynne announced on Thursday. Premier Wynne also announced new legislation – the Ending Coal for Cleaner Air Act – which will permanently ban coal-fired electricity from the province, making Ontario the first jurisdiction in North America to do so. To dramatize these announcements, Premier Wynne welcomed Al Gore, former vice-president of the United States and chairman of the Climate Reality Project, to the MaRs Discovery Centre in Toronto. “To solve the climate crisis, we need people, provinces and countries to show the way forward towards a coal-free, sustainable future. 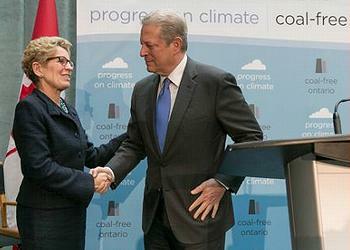 Ontario has distinguished itself as a leader in Canada and around the world,” said Vice-President Gore. “It is heartening to see the tremendous progress that has been made here and it is my hope that others will quickly follow suit,” said Gore. The elimination of coal from Ontario’s grid is the largest greenhouse gas reduction project on the continent. Coal is being rejected in favor of natural gas and renewables. Ten years ago, coal-fired electricity supplied 25 percent of Ontario’s energy needs, at a cost of C$4.4 billion to the province when the environmental and health impacts were included. But coal-fired electricity is being phased out. In 2005, there were 53 smog days in Ontario and in 2013 there have only been two. Located on the north shore of Lake Erie in Haldimand County, Ontario Nanticoke has had eight generating units in operation, generating enough electricity to run two million homes for a year. Four of the station’s eight generators have been retired. In January, the Ontario government announced that the remaining units will stop using coal by the end of 2013. The Independent Electricity System Operator agrees that these units are no longer needed to ensure a reliable supply of electricity to the province for the foreseeable future. “Ontario has shown the world that bold action on climate change can be done,” said Tim Gray of Environmental Defence, an Ontario-based environmental group that advised on the ambitious energy initiative and hosted the announcement event. Renewable power generation is being installed to replace the coal-fired power. In the past four years, more than 7,100 megawatts of new renewable energy projects have been installed or announced and an estimated 31,000 jobs have been created as a result, says Environmental Defence. More than 25,000 homes, farms, schools, churches and businesses have also installed or been accepted to build small-scale grid-connected Solar PV projects.